Details: Vertical Gardens in the Show Room of Graseko s.r.o. The Atlantis vision is to create ecologically sustainable cities and communities, by integrating urban development with nature. By combining air, water, flora and land to function in harmony with urban development, water and air can be filtered, cleaned and purified. The result is revolutionary Green Cities which function like natural ecosystems. Today’s cities consist mostly of impervious surfaces producing high amounts of contaminated water and heat which contribute to the degradation of our waterways, oceans and depletion of the ozone layer. Water and air are needed in all aspects of life and their sustainability has to be ensured for future generations. Looking towards nature has given Atlantis solutions to these problems that affect us all. Adds greenery to the cityscape with resulting lowering of temperature and cleaning the air, and improves the visual impact of the city thus increasing the liveability of the city. Performs as a thermal insulator for buildings, cooling in summer and retaining heat in winter. Is a highly effective sound insulator holding up to 140L of soil media per square metre. Projects are scalable from small 0.5sq. m vertical gardens for people living in apartments to cladding for 10 storey buildings, thus each person and property owner can have his or her own urban allotment. There is a growing Green Urbanisation movement in Western Europe particularly in London and Paris and advanced green roofs in Germany. This movement has the same ideals as Atlantis Green Cities. This movement has now expanded into the Czech Republic. 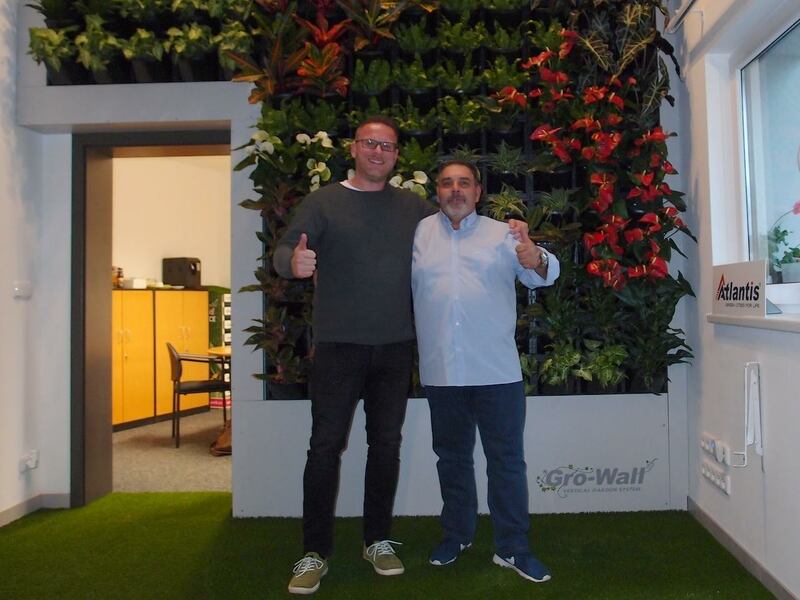 We wish to thank our distributor in the Czech Republic, Graseko s.r.o., for these beautiful vertical gardens which were constructed in their show room in Ostrava. 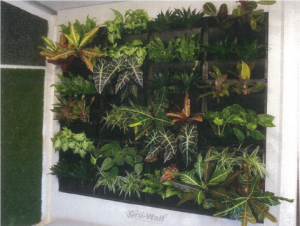 The first comprises 13 kits of Atlantis® Gro-wall® 4.5 vertical gardens totaling 12.5sq. m, and has 11 types of plants totaling 213 plants. The automatic irrigation system comprised 213 drippers @ 2L / hr. rating with the daytime lighting running for 16 hours per day. The installation took 5days. 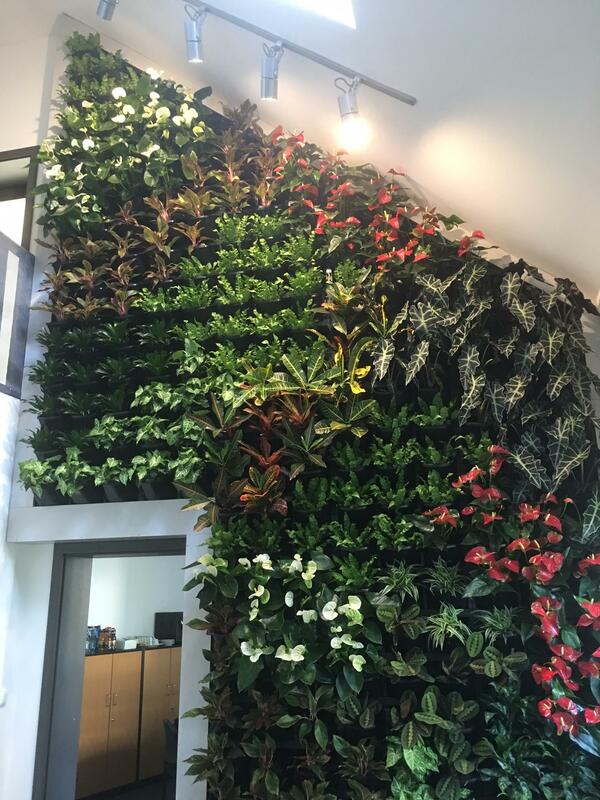 The second comprises 4 kits of Atlantis® Gro-wall® Slim Pro ™vertical gardens totaling 2.88sq. m, and has 10 types of plants totaling 48 plants. The automatic irrigation system comprised 48 drippers @ 2L / hr. rating with the daytime lighting running for 16 hours per day. The installation took 2 days. Atlantis is exited to witness the expansion of our vision across Europe as represented by these two Beautiful vertical gardens.